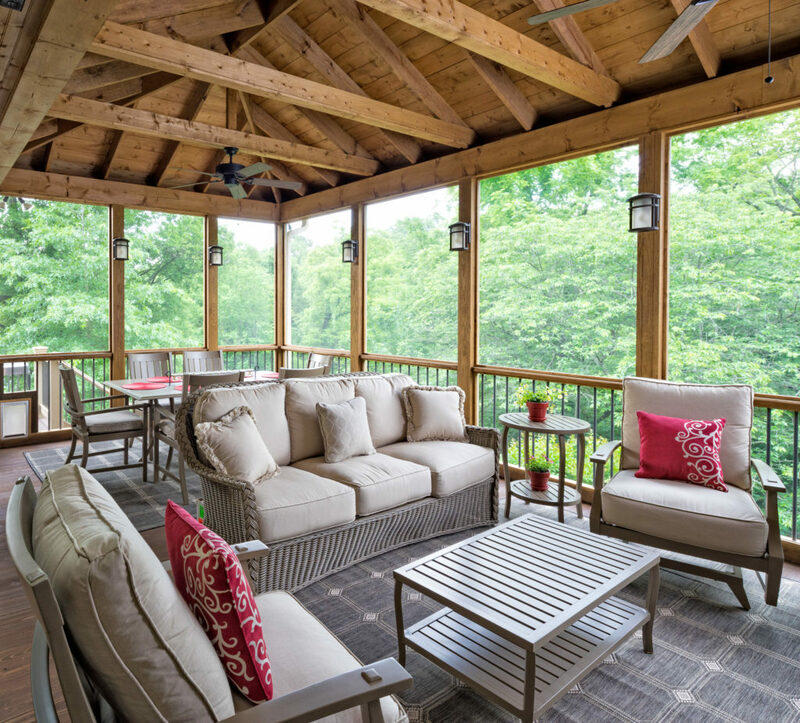 As nature transitions through the phases of spring in middle Tennessee, there is no better place to be than your screened porch. From the porch, you have a front row seat to the wonders of this amazing season. Each day we are treated with an infinitesimal amount of change as trees bud and bloom. Flowers peek out, pause, and unfurl. Who needs television when there is such a show as this outdoors? Screened porches just make so much sense this time of year! Of course, around here at The Porch Company, we’re fond of our porches all year long. But if we had to pick a time of year when a person absolutely should not be without a porch, it would be spring. While the first day of Spring 2019 has passed, temperatures seem to be lagging behind the calendar. It can still get nippy around the Nashville area at night. If you’re thinking that means it’s not porch weather, guess what? 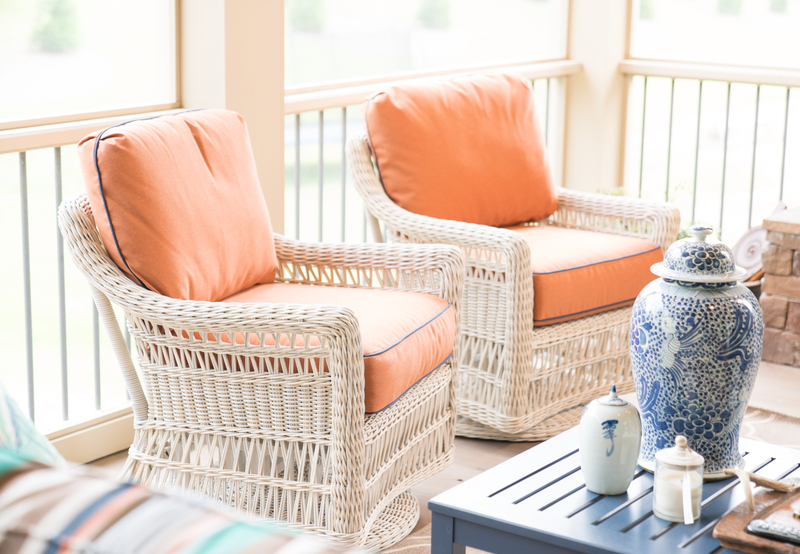 Okay, you’ve guessed it … at The Porch Company, any weather is screened porch weather. At your home, any season can be screened porch season if you have the right heater. Yes, we have a special way of keeping our clients warm and toasty on the porches we build for them. When we find a product that works well, we keep using it – and we keep recommending it. Solaira infrared heaters are our secret weapons against the chill. We install Solaira heaters in many of the porches we build. We also build quite a few porches with outdoor fireplaces, but we tell our clients these fireplaces are primarily decorative. No matter how much you love a fireplace, it’s not an efficient way to heat a porch. Cooler air rushes in continuously. The fire’s heat disperses into the outside air and the porch never retains enough heat to keep you warm. Whether you prefer a wood-burning fire or a gas flame, fireplaces are beautiful and enjoyable. That’s why we recommend you choose an infrared heater to accompany your fireplace in an outdoor room. Infrared heaters direct energy outward in straight lines, warming anything the infrared waves touch. Infrared waves are on the electromagnetic spectrum (along with visible light, microwaves, radio waves, etc.) but are invisible to us. 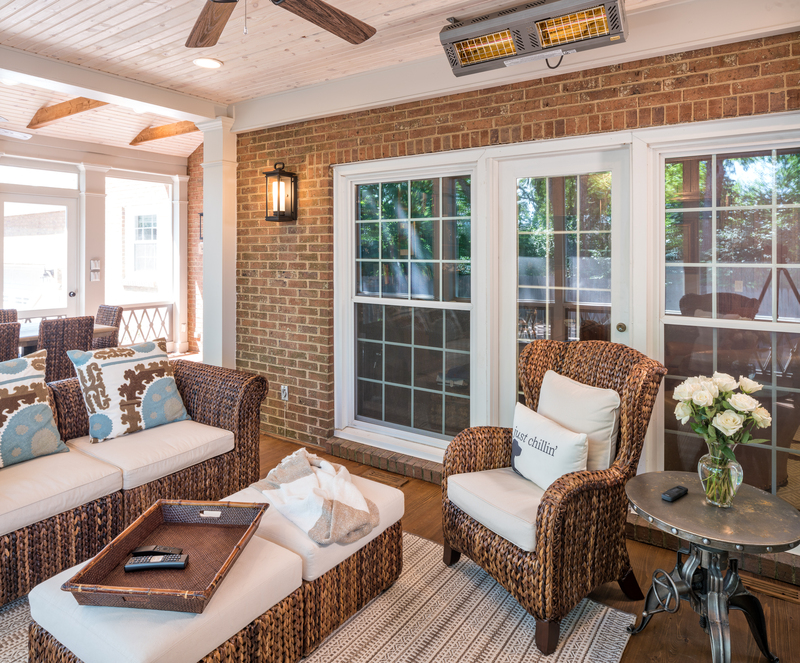 Infrared heaters are energy-efficient, so they’re economical to use, even on a porch. Especially on a porch! We often mount them on a client’s porch at the point where a wall meets the ceiling. We can also mount them on the ceiling; we can suspend them from the ceiling, and some of Solaira’s heaters can be recessed. It’s possible you wouldn’t notice the heater if you didn’t already know it was there. 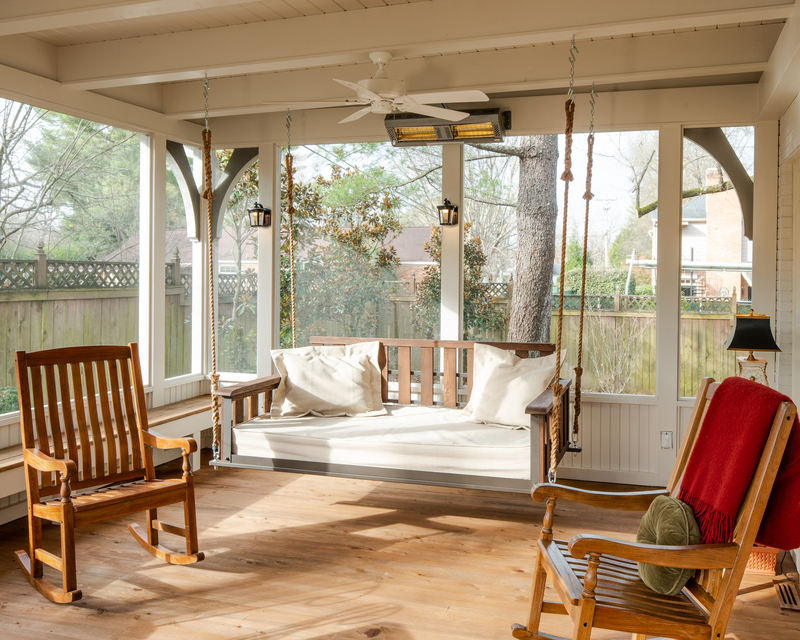 Weather, good or bad, is one of the main reasons screened porches are so popular. Our cool spring nights will soon give way to warmer days and nights. Spring and early summer can bring rainy and stormy days. With a screened porch, you don’t have to retreat indoors like a hermit during a storm. You can still enjoy the aroma of spring rain and the warm wisps of a spring breeze right before a shower. How romantic is the sound of rain in the background? It can also be quite soothing. Of course, when spring rolls in, summer’s heat can’t be far behind. Your screened porch will protect you from harmful UV rays. Being shielded from the sun also means you’ll stay a bit cooler outdoors. Eventually, though, we get those stifling hot summer days – and nights – when the air is sultry and still. Where will you want to be? 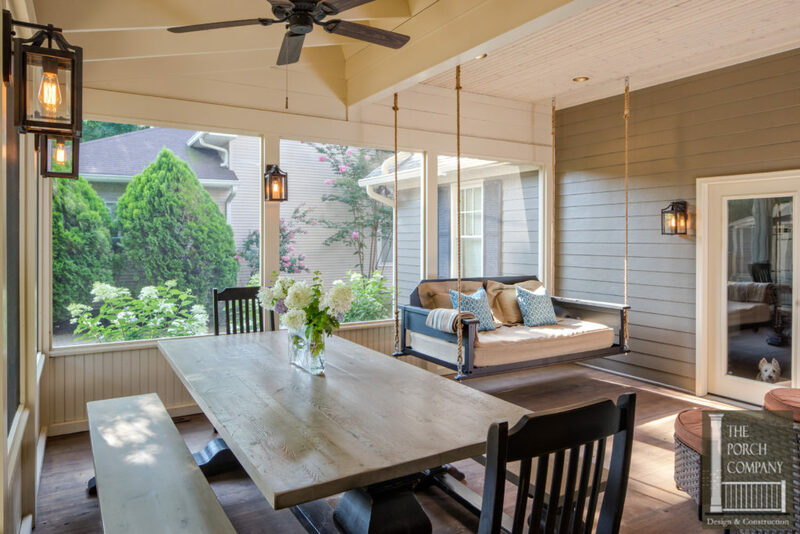 On your screened porch with a ceiling fan (or two)! Most of the porches we design and build for our clients include at least one ceiling fan. It just doesn’t make sense to have a porch in the south without a ceiling fan. 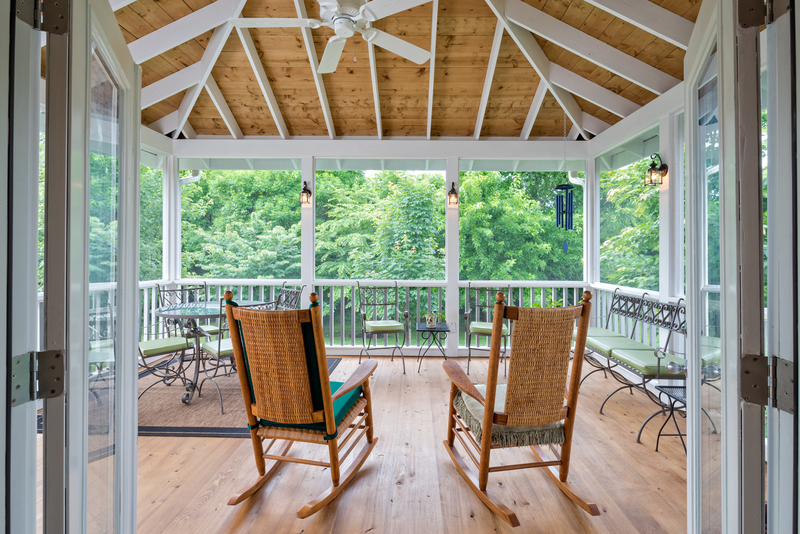 Even if your porch has a high ceiling for added ventilation, we recommend including a ceiling fan. When you can’t coax a breeze on a hot summer day, no amount of iced tea is going to cool you down. If you don’t enjoy the pesky insects that come around in warmer seasons, but love being outdoors, a screened porch is the perfect solution. Which insects torment you outdoors in the summer? For many of us, it’s mosquitoes, but you may be plagued by flies, bees, wasps, etc. Some of these little creatures are beneficial, but we don’t necessarily want them buzzing around us. Dining outdoors is certainly more enjoyable on a screened porch. We hope all this talk of screened porches is making you walk around the outside of your home to determine where your new porch will go. 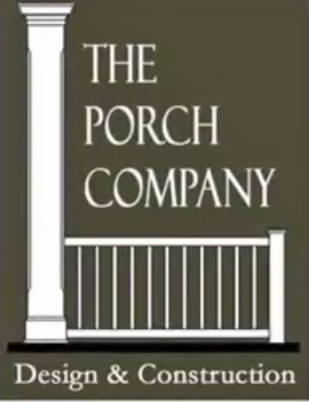 If you are interested in having The Porch Company design and build the perfect porch for your home in the Nashville area, call us at 615-663-2886 or come by our design studio. We would love to meet with you to discuss your porch needs any time of year!